Hundreds of earthquake-affected people in Nangarhar Province, eastern Afghanistan, are in urgent need of shelter and drinking water, aid workers and local residents say. More food and better essential health services are also required. “Shelter and safe drinking water are most needed,” Abdul Matin Edrak, director of Afghanistan’s National Disasters Management Authority (ANDMA), told IRIN on 19 April. Emergency relief supplies, including tents, jerry cans and food items, have been distributed by various donors in Sherzad and Hisarak districts where two earthquakes measuring 5.5 and 5.1 on the Richter Scale occurred on 16 April, according to ANDMA. ANDMA’s latest figures show 21 people were killed, 59 wounded and some 500 families have been affected by the quake. Provincial authorities said cash assistance was provided to most affected families though several local people said little or no meaningful assistance had reached them. “Aid has only been nominal and in words,” said one man in Sherzad District, about 60 km southwest of Jalalabad, Nangarhar’s provincial capital. “We have passed two nights in the cold weather in the open,” said another resident. Aid agencies have launched needs assessments in order to ensure a coordinated humanitarian response and the UN World Food Programme (WFP) conducted an oversight flight of the area to examine the extent of the damage. “Initial reports indicate that there is sufficient civilian humanitarian assistance and response capability in-country,” the UN Office for the Coordination of Humanitarian Affairs (UN OCHA) reported. Food and non-food items have also been distributed by Afghan and international military forces in Nangarhar, NATO said in a statement. No disruption in essential services – such as electricity, tap water, healthcare and telecommunications - in either of the remote districts has been reported though 290 homes were totally destroyed and hundreds more made uninhabitable, according to ANDMA’s Edrak. The livelihood of tens of thousands of people has been harmed because livestock have been lost and agricultural land has been damaged, aid workers said. The government said it will compensate families 30,000 Afghanis (about US$600) for every death and about $200 for every house damaged in the quake, ANDMA said. 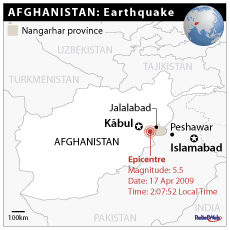 Parts of eastern, northeastern and central Afghanistan are prone to seismic waves and this natural vulnerability has been exacerbated by the prevalent illegal and substandard construction of houses, weak essential infrastructure and widespread lack of awareness on the risks of earthquakes and other natural disasters. The most recent major earthquake the country suffered was on 4 February 1998 when a 6.1 magnitude quake killed some 3,650 people, destroyed thousands of houses and displaced tens of thousands of people in the northeastern province of Takhar, according to the Afghan Red Crescent Society.